Calling 08 numbers on your mobile is expensive. Let us try and help you save money. There is simply no need to spend up to 41 pence per minute calling 0845, 0800, 0844 and 0870 numbers from your mobile anymore. 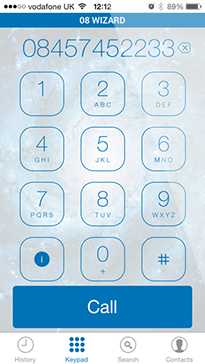 Barritel have developed a money saving app called the '08 Wizard', an app full of the most popular businesses using 08 numbers and their alternative 01/02 and 03 numbers. 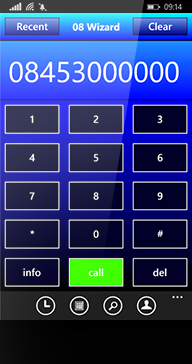 When you search for, or dial an 08 number, the app will see if it's in the database and if it's there, will present you with a local rate number to call. Call charges to 01, 02 or 03* numbers are taken from the bundled minutes you already have instead of your wallet. There is no difference to the call, you're simply dialling the number directly instead of going through an 08. We are always adding the most requested numbers to our database and currently have over 27,000 to choose from. There are of course therefore a vast number of businesses we don't have alternative numbers for, but there's still enough for most people to save a wad of cash. We're confident there is a number or 2 for you to save on! All successful calls will be made across the businesses 01 or 02 number or a dynamic 03 number (which costs the same as an 01/02 and is taken from your bundled minutes). PAYG and people outside their bundled minutes will be charged at normal local rates. 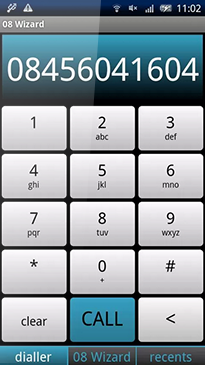 Users who choose to dial the 084 and 087 numbers direct will be charged the full cost by their network provider!